This recording features a mix of classical tuba solo repertoire, such as the title track, composed by Faye-Ellen Silverman, and also tuba in an electronic setting. The album introduces my debut solo composition entitled Convent Window, an unaccompanied work for solo tuba. In addition, the album showcases four newly composed pieces which are tuba in an electronic setting, composed by myself and electronic artist Bill Bendrot. Recorded October-December 2014. 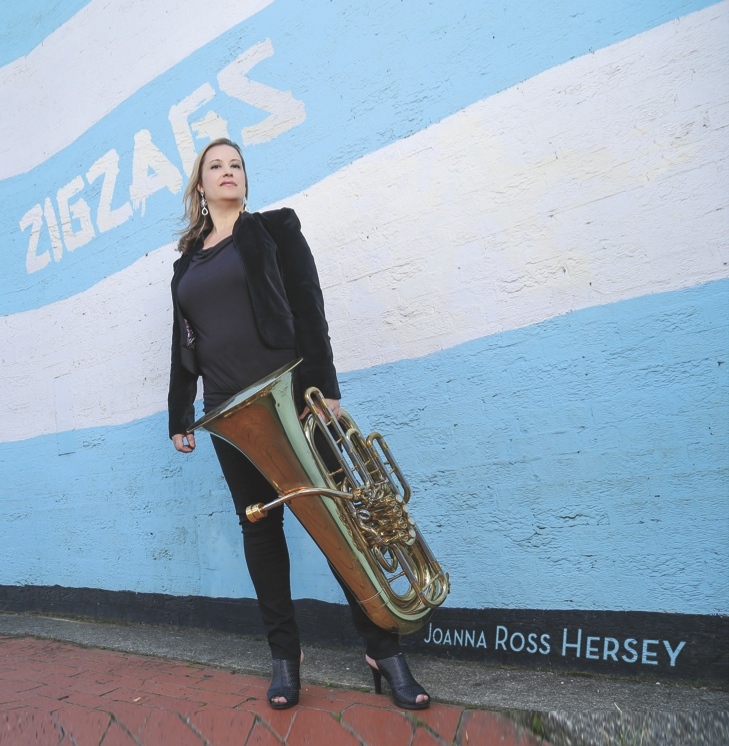 Joanna Ross Hersey’s second solo album, Zigzags, features four new compositions, co-composed with electronic musician and husband William Bendrot, which place the tuba and euphonium in an electronic music setting featuring collaboration through both composition and improvisation. The opening piece, Tether, is somewhat sparse, with a slow, moody, rock influence, based on futuristic cyberpunk anime compositional imagery, such as Ghost in the Shell. This track features spoken word using text from several Emily Dickinson poems.Shatterdome was inspired by the drama in film writing at climactic moments when good and evil collide and dark forces are at work, utilizing low resonances and a focus on brass. One is upbeat, and incorporates brighter harmonies in fast-paced rhythmic development.Kakera, the Japanese word for a small piece or fragment, uses the tuba in the pedal register in combination with faster bass lines. Three other works round out the album, including the title track, composed in 1988, a ten minute unaccompanied tuba solo by New York composer Faye-Ellen Silverman. The work showcases extreme register, set in a wide variety of tempo and mood, and utilizes extended techniques such as multi-phonics and flutter tonguing. The album also contains a new arrangement by Joanna of the music of Hildegard von Bingen, as well as a solo for unaccompanied tuba, entitled Convent Window, composed for this album. Joanna’s first solo tuba composition, Convent Window envisions the composer Hildegard von Bingen pausing for a moment of calm reflection at her window. The work utilizes the resonant, lower register of the instrument.